Madrid - Spain's state prosecutor on Wednesday ordered a criminal probe of Catalan mayors who cooperate with an October 1 independence referendum deemed illegal by Madrid and threatened to arrest those who do not comply. The prosecutors' office ordered the mayors who have agreed to help stage the vote be summoned to court as official suspects and if they do not appear to "order their arrest", according to a copy of the ruling obtained by AFP. Catalonia's pro-separatist government has asked the wealthy northeastern region's 948 mayors to provide facilities for polling stations for the plebiscite. So far over 700 mostly smaller municipalities have agreed to participate. Prosecutors have already launched an official complaint against Catalan president Carles Puigdemont and members of his government over their referendum plans, accusing them of civil disobedience, misfeasance and misappropriation of public funds -- the latter carrying jail sentences of up to eight years. Prime Minister Mariano Rajoy's conservative government has vowed to do everything in his power to stop the referendum. It argues Spain's 1978 constitution stipulates that regional governments can not call an independence referendum. Spain's Constitutional Court has suspended a referendum law that was fast-tracked through Catalonia's regional parliament last week but the Catalan government has vowed to go ahead with the vote nonetheless. The court has since 2015 declared regional independence referendums to be unconstitutional. Catalan authorities routinely ignore the court's decisions as they do not recognise its legitimacy. Catalonia, which is roughly the size of Belgium and accounts for about one-fifth of Spain's economic output, already has significant powers over matters such as education and healthcare. But Spain's economic worries, coupled with a perception that the region pays more in taxes than it receives in investments and transfers from Madrid, have helped push the cause of secession from the fringes of Catalan politics to centre stage. Adding to the rise in separatist sentiment was a 2010 ruling by the Constitutional Court striking down parts of a 2006 autonomy charter which granted new powers to Catalonia and recognised it as "a nation". 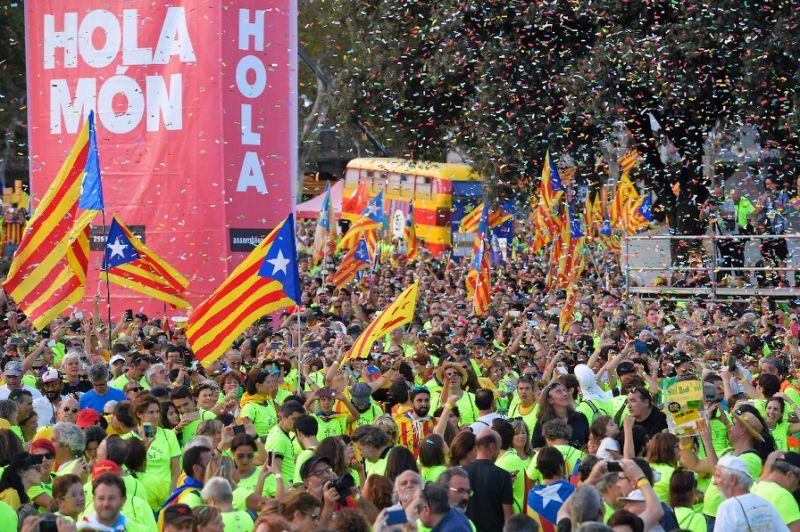 Hundreds of thousands of Catalans rallied on Monday in Barcelona on their national day to demand their region's secession from Spain and support the right to vote. Spain's state prosecutor on Wednesday ordered a criminal probe of Catalan mayors who cooperate with an October 1 independence referendum deemed illegal by Madrid and threatened to arrest those who do not comply.